It's hot, hot, hot in DC, and I'm staying in, in, in. 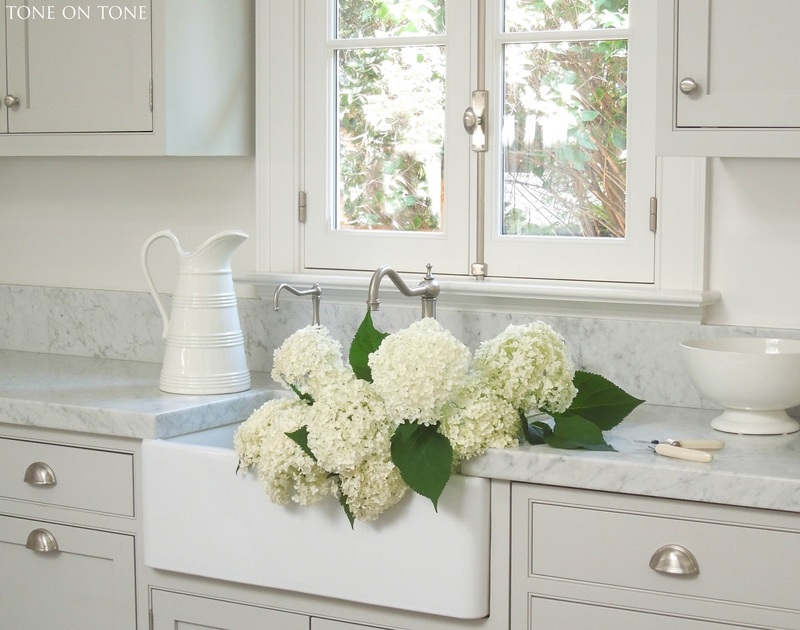 Now is the time to enjoy the gardens from inside. And, now is the time to catch up on my myrtle topiary plants: trimming, repotting, and fertilizing. There's a reason why I am so devoted to the topes. 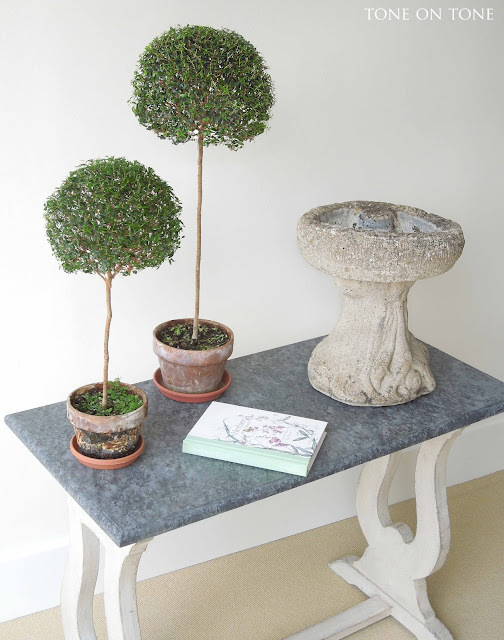 Actually, there are many but, for this post, I'll narrow it down to just this one: they are mini evergreen gardens for inside the home. This is especially welcomed when it is too hot or cold to work outside. With careful shaping and nurturing, topiaries become more than houseplants, they are elevated to civilized yet humble living sculptures. 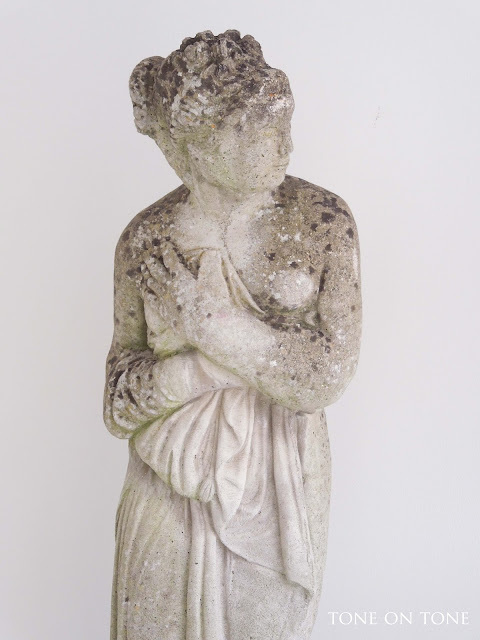 Along with myrtles, I try to infuse our home with pots, statues and other ornaments that have gathered a layer of moss and lichen from sitting outdoors. Introducing this earthy patina into our Swedish palette adds organic charm and warmth to the cool tones. 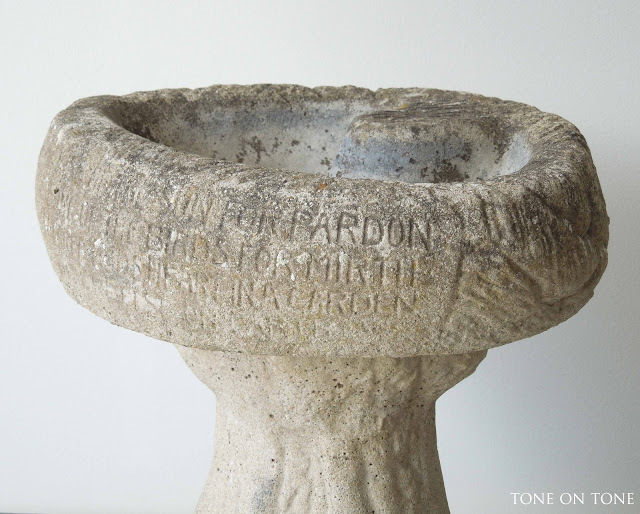 It also creates harmonious flow between house and garden. Let's dig around the shop for a bit of garden inspiration! 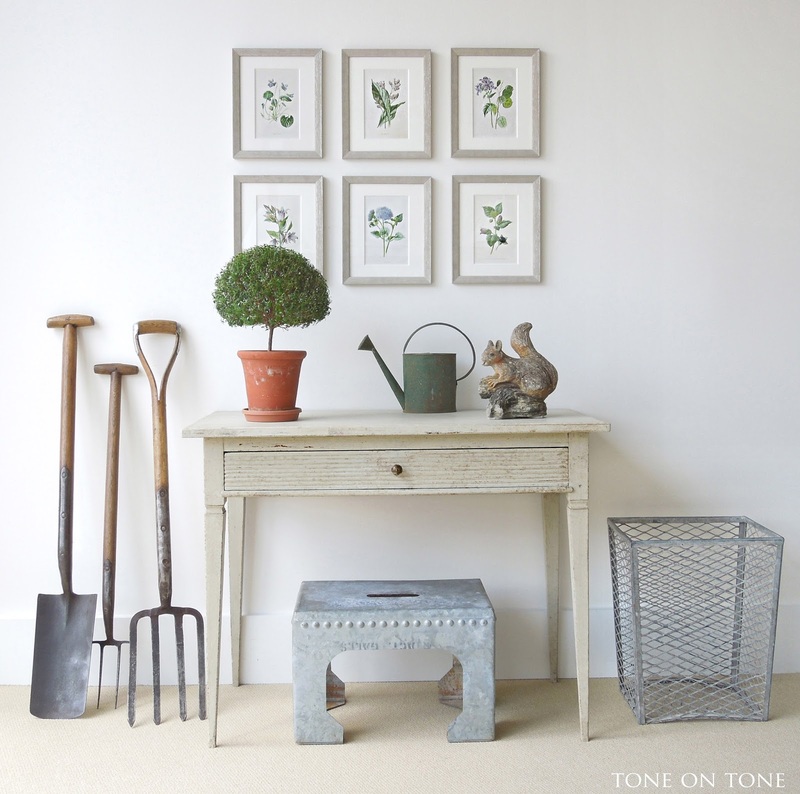 ABOVE: Cute meets industrial in this potting shed-inspired vignette. 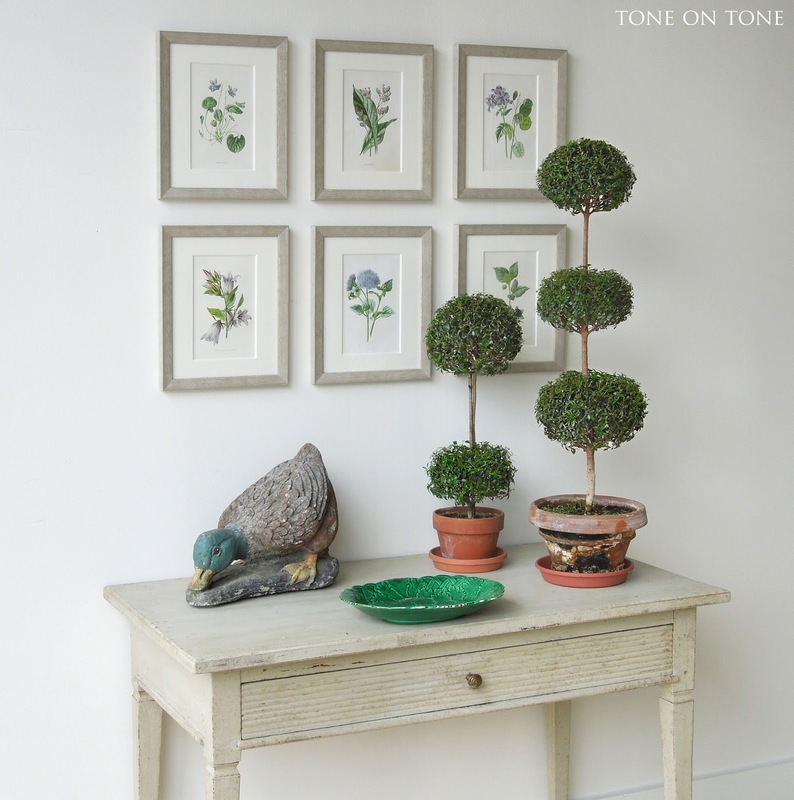 A grouping of 19th-century botanicals hangs over a tablescape of myrtle topiary, vintage concrete squirrel and child's watering can on an 18th-century Swedish Gustavian table. The sweetness is tempered by the galvanized stool and basket along with the utilitarian tools made for the English lady gardener. 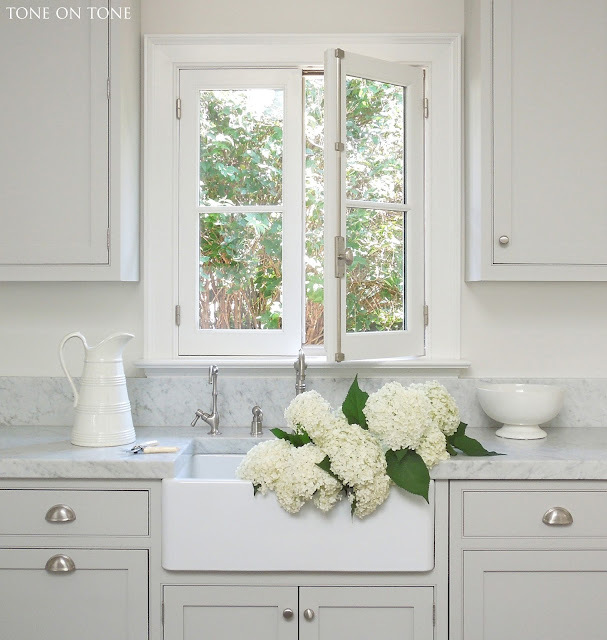 While I wouldn't have the vintage tools lining the walls of a drawing room, they would surely add charm to a mudroom or back hall - so handy, too, on the way out for a little gardening. BELOW: What better way to bring in the garden than botanicals with pretty blooms the entire year! The frames on these classic English prints have a gray finish highlighted with a tinge of silver for an updated look that's fresh. 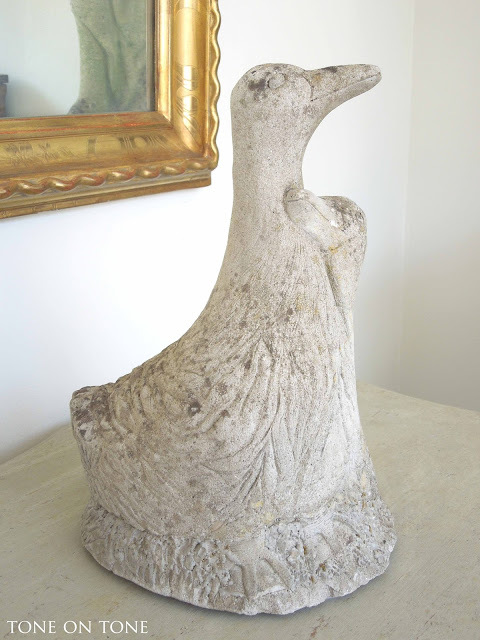 And this early painted duck, in an animated grazing position, adds whimsy to the perennial border or inside on a table, chest, bookshelf, etc. 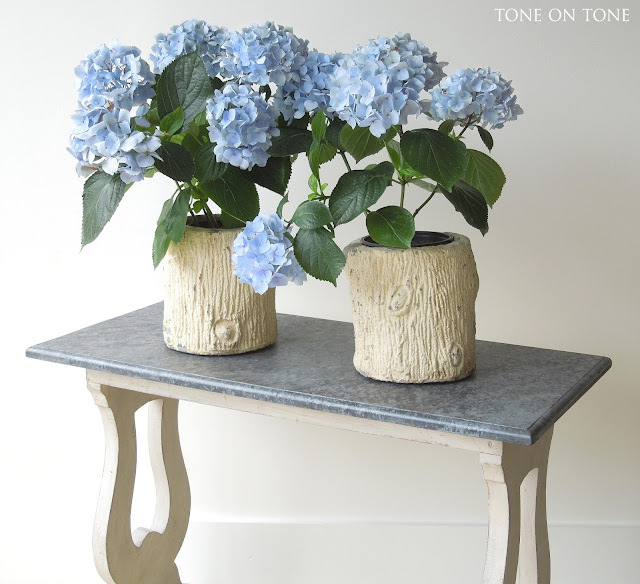 Speaking of whimsy, this pair of painted concrete faux-bois planters would make any room feel less formal. They would be fun with vibrant blooms or more naturalistic with verdant ferns. 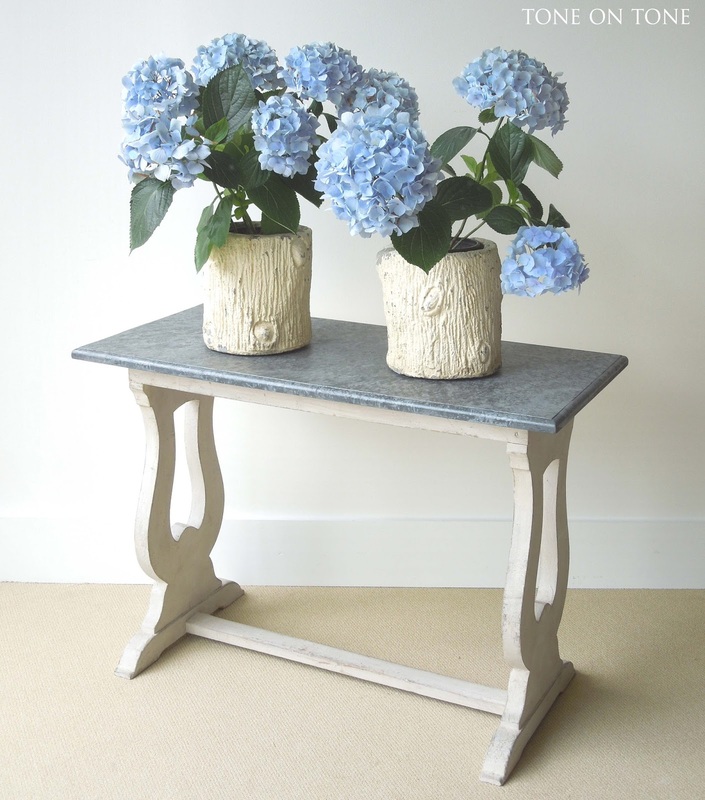 The pots sit on a Belgian console table with a stone-like painted top and sculptural lyre ends. 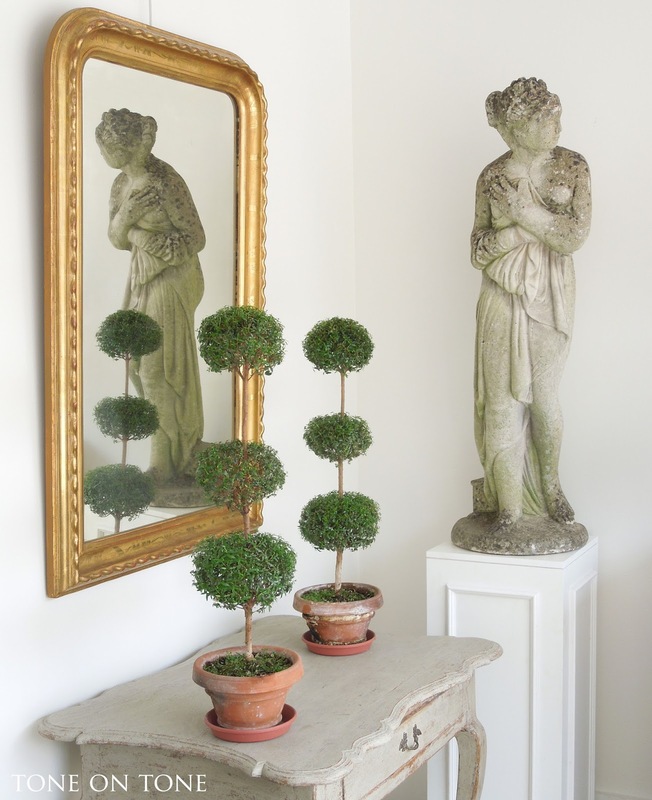 I know, I know - my topiary addiction is out of control!! Moving on....let's check out this Ca. 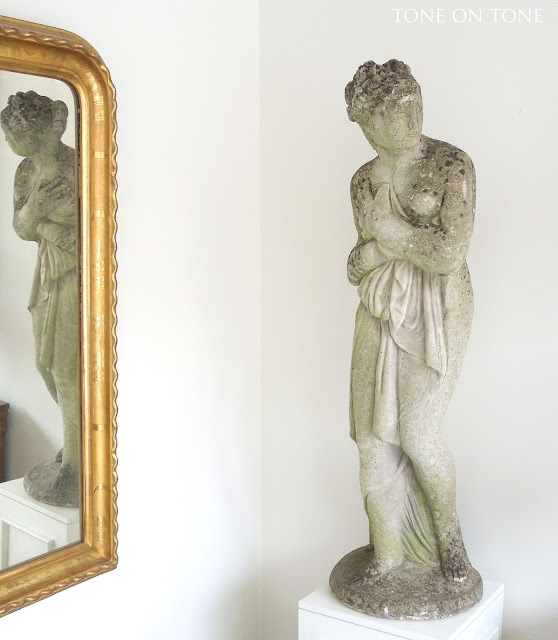 1920s cast composition statue of Venus at the bath. Venus is in terrific condition with an authentic patina. 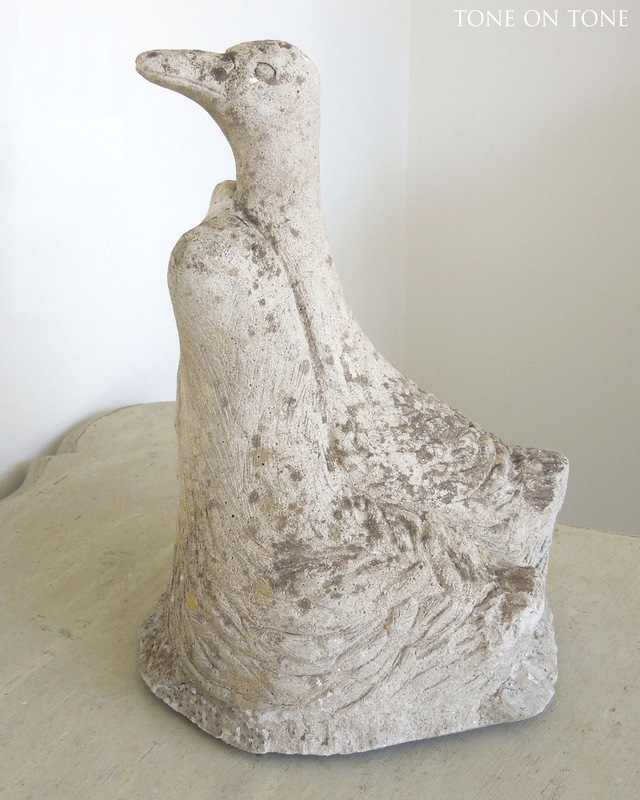 Do you have a corner in your home for her? More ducks :) Here is an embracing pair sure to make you smile. 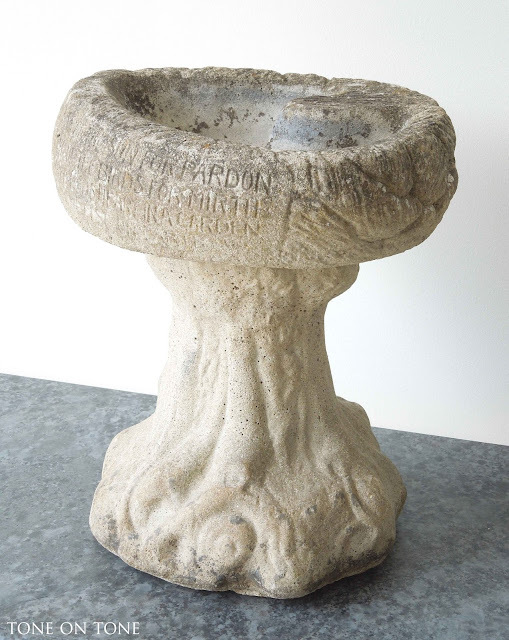 What's the easiest way to bring the garden in? 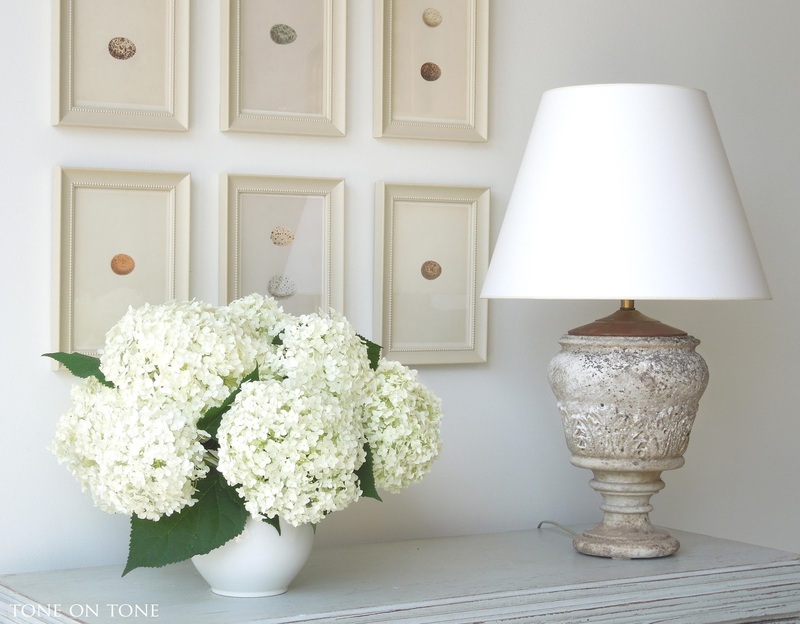 Freshly picked flowers, especially this time of year, are a must! I adore the fluffy white blooms on these Annabelle Hydrangeas from our garden. I've cut generous bunches of Annabelles for our shop, as well. 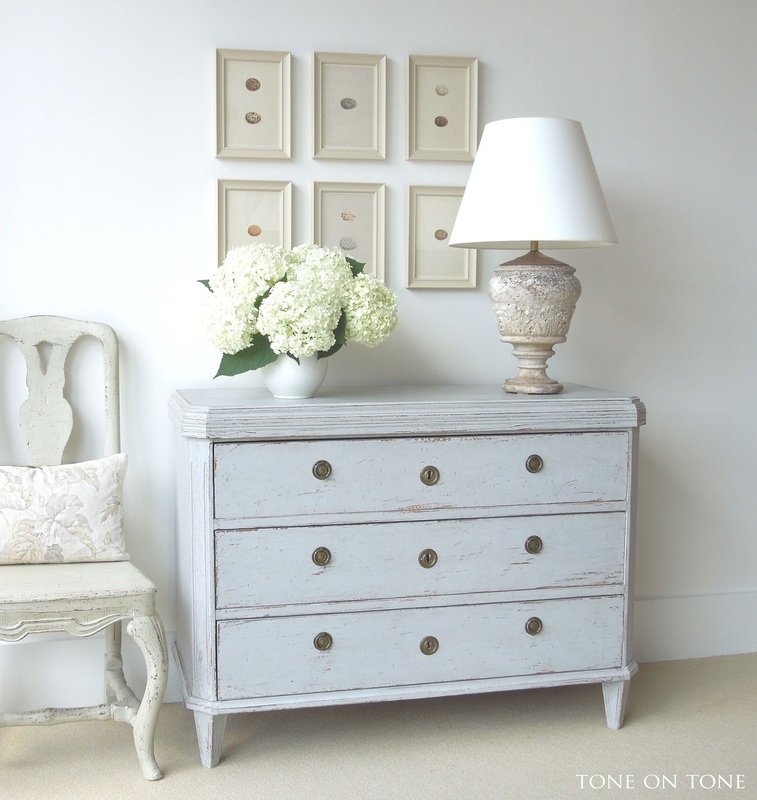 Here is an arrangement on a pale-blue Swedish chest. The antique egg prints are English, and so is the marble urn that I converted into a lamp. 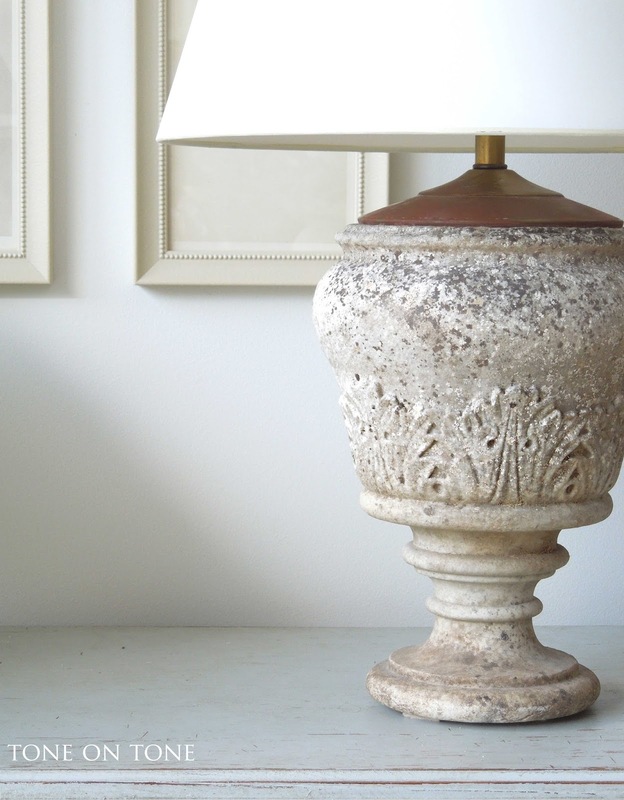 Notice the acanthus carving on the marble urn. 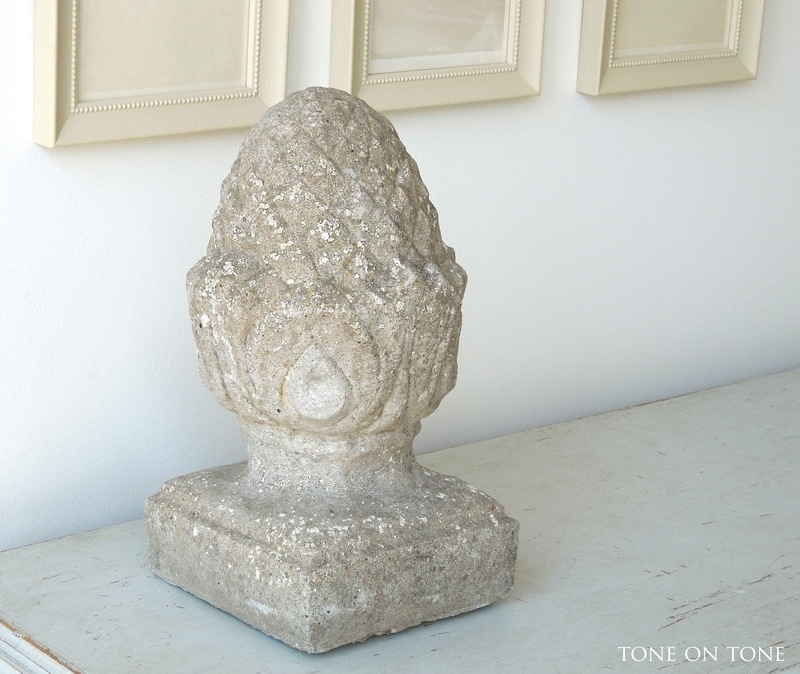 BELOW: A cast composition footed pinecone finial ready to add a bit of patina to your vignette - use it where visual weight is needed or where a masculine accent is desired. Those of you following along on Instagram will recognize this arrangement of Halcyon Hostas and Minnie Pearl Phlox in a Chinese blue-and-white pot - I shared it in early June. BTW, the arrangement lasted almost a week. The Midcentury Modern pedestal table has a glass top over a lucite base. 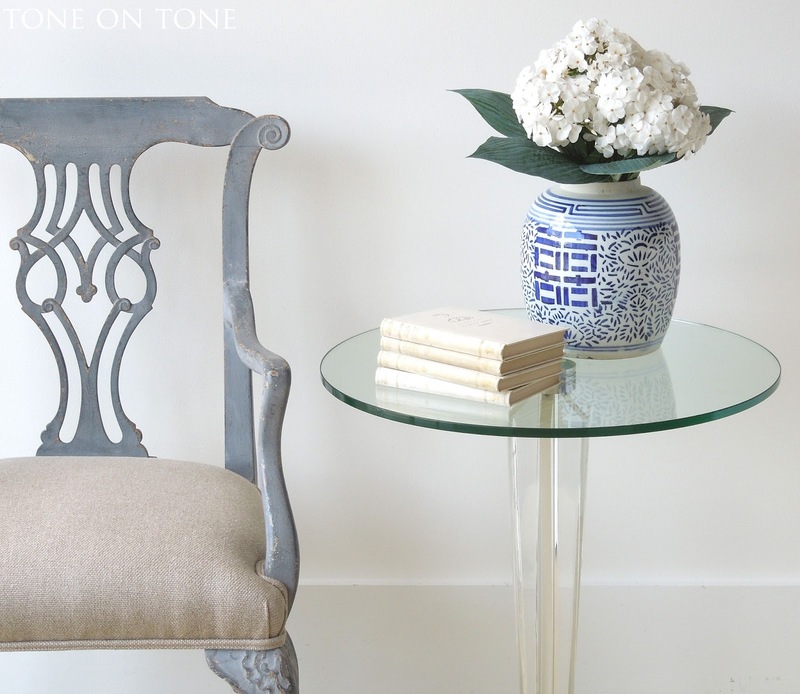 It looks especially chic juxtaposed next to an English Chinoiserie armchair with ornate fretwork backrest. 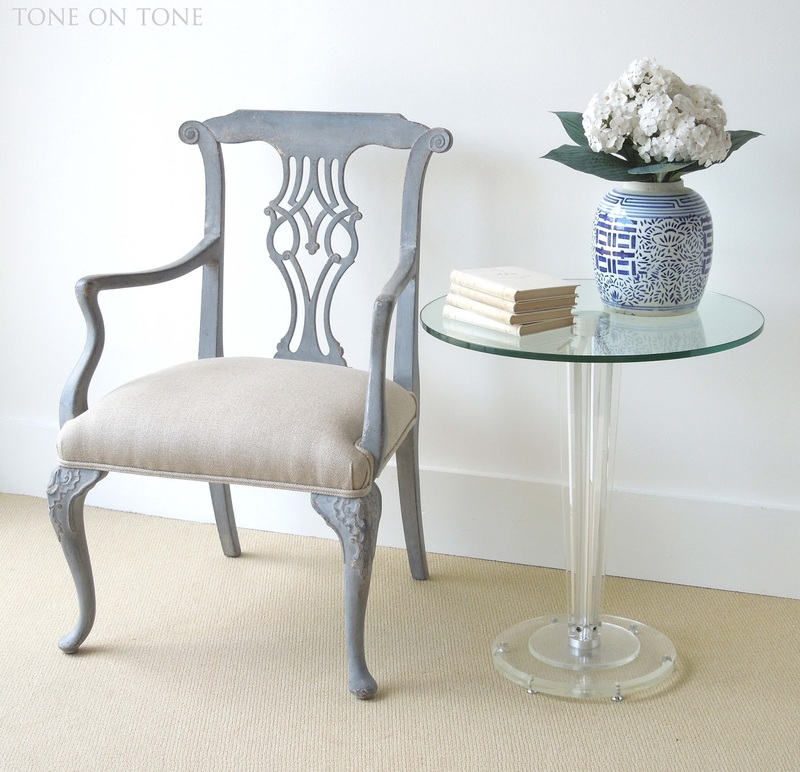 The armchair is part of a dining set of eight. For more inspiration, please come visit the shop! Though summer officially starts June 21st, it already feels like it with the long days. There is a sense of ease in the air. Traffic appears gentler, parking seems easier, and the ice cream truck is back in action :) I really look forward to these days, and try to squeeze in as much outside time in the garden as possible. By the way, my nieces and nephew, Monica, Tiffany and Alex, have just graduated from college - how time flies! I couldn't be more proud!! Congratulations to them. 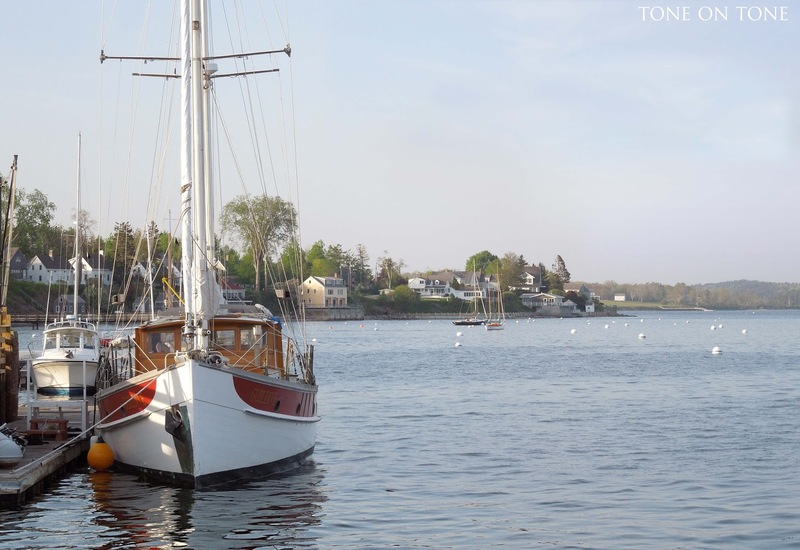 This is also the time of year when summer folks start returning to their homes in Castine, Maine. Over the Memorial Day weekend, Tom and I went there to open up our home. It felt more like spring with sunny afternoons and chilly nights - think short sleeves during the day and flannel PJs at night. And it was a lovely surprise to find the forsythias still in bloom. After cleaning and dusting, we attended the garden club's sale, had dinners with friends, joined the Memorial Day procession, and strolled down to the town dock for ice cream. 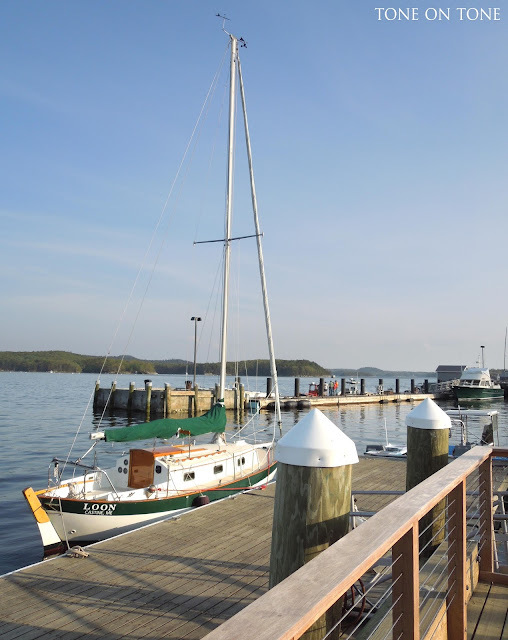 Castine has a very deep and picturesque harbor with views of various islands and Brookesville across the bay. 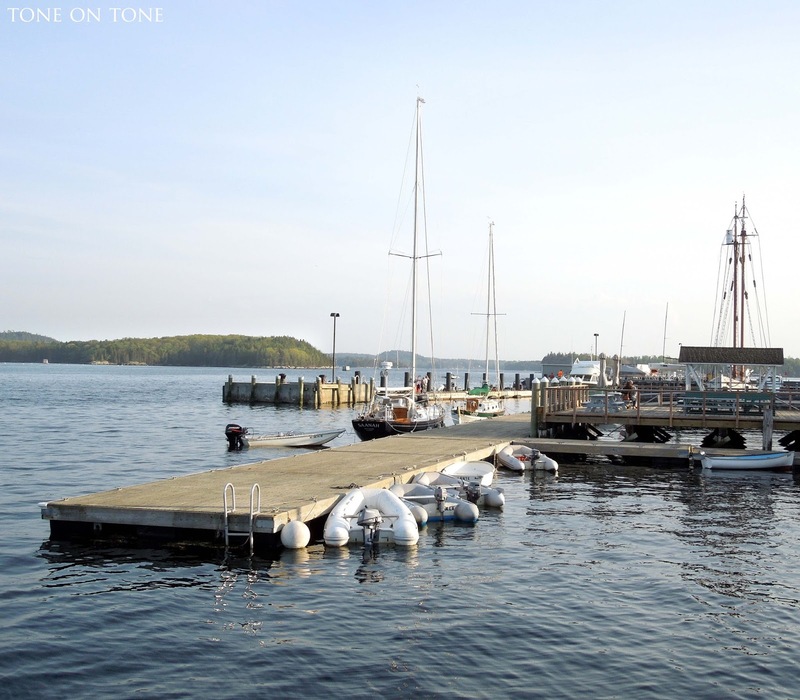 Soon many boats will once again be back at their moorings. 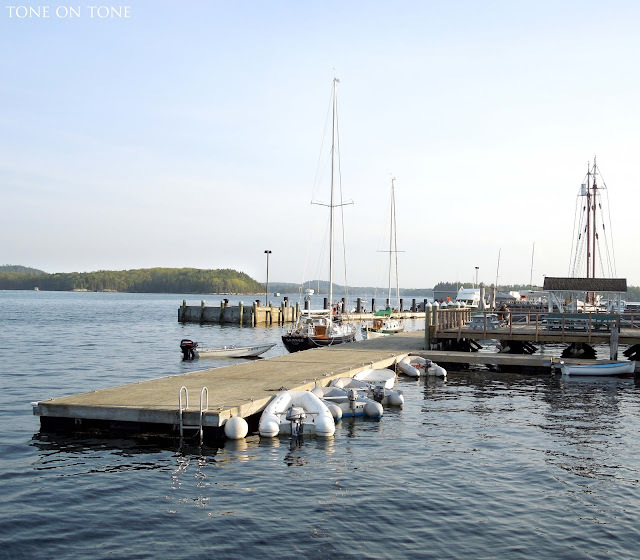 It looks like the town dock, with new railings and freshly cleaned floats, is all ready for the season ahead. 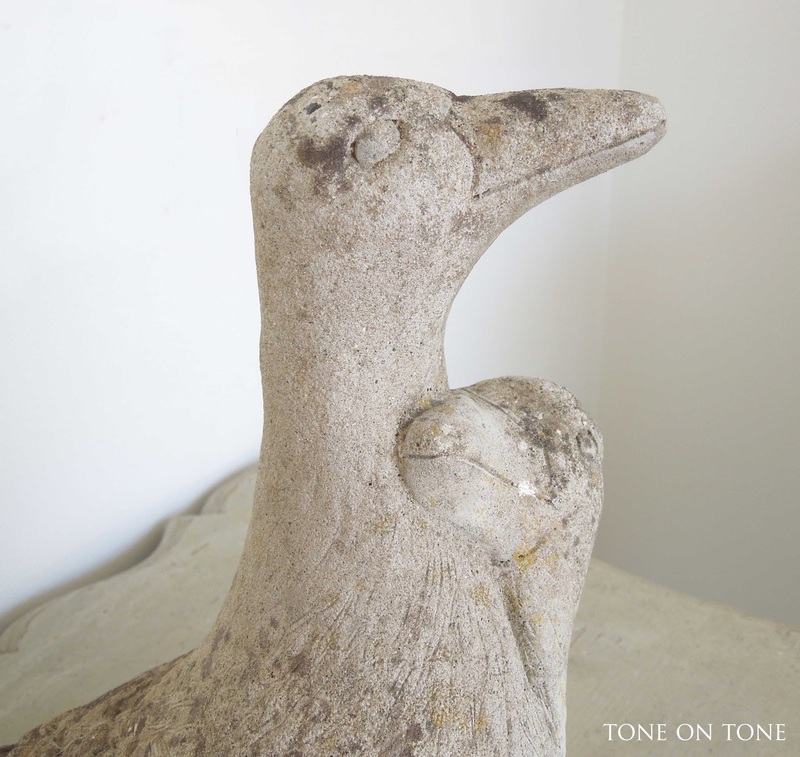 See the end of this post for exciting news! 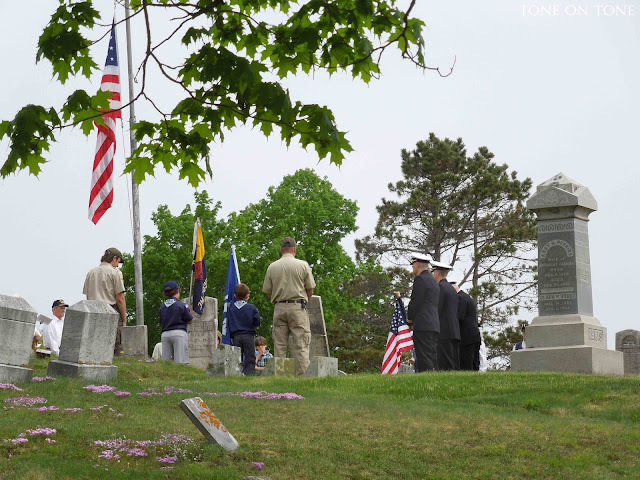 Each Memorial Day, Castine pays tribute to the fallen with an observance at the town cemetery. Afterwards, the procession, including flag bearer, veterans, residents, guests, officials, band Castine Fife and Drums Corps, and cub scouts, moves down to the town common for a reading, song and dedication. The procession finally ends at the dock with a laying of the wreath in the harbor to honor those lost at sea. See more photos from last year here. Afterwards, we visited Fort Madison located near the mouth of Castine harbor - it's one of our favorite places to watch the boats come and go. 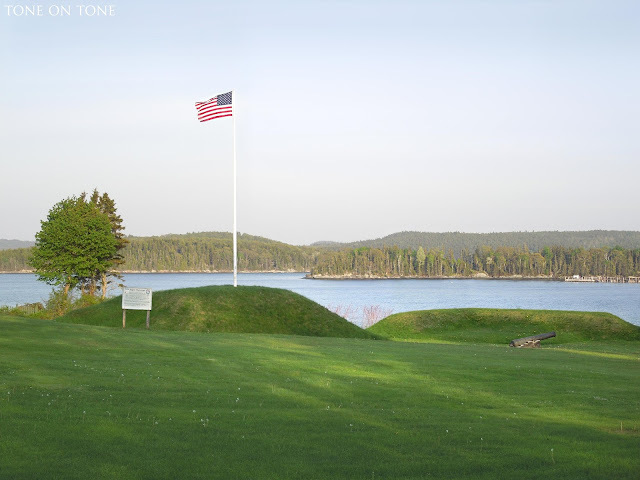 This is a popular place for picnics and, during the summer, weddings, as the view out to the Penobscot Bay is breathtaking. Since acquiring our home, we've done quite a bit of work. 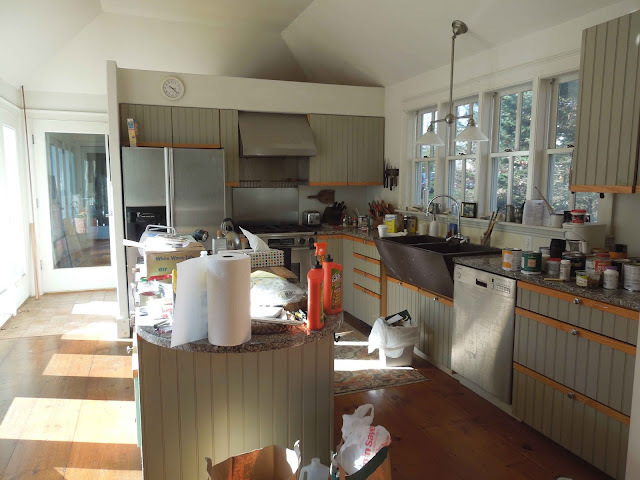 Let's check out the changes in the kitchen starting with a "before" photo taken when the prior owners were moving out. 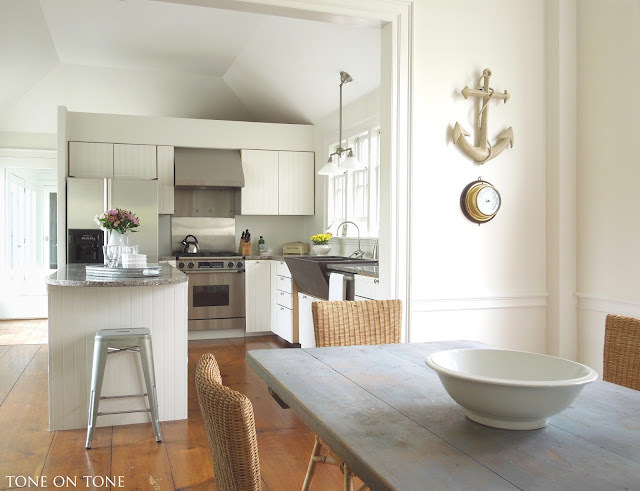 The kitchen is located in the new part of the house - an addition off the old kitchen, which is now the breakfast room. The addition also consists of a powder room as well as a screened porch connecting to the barn / garage. 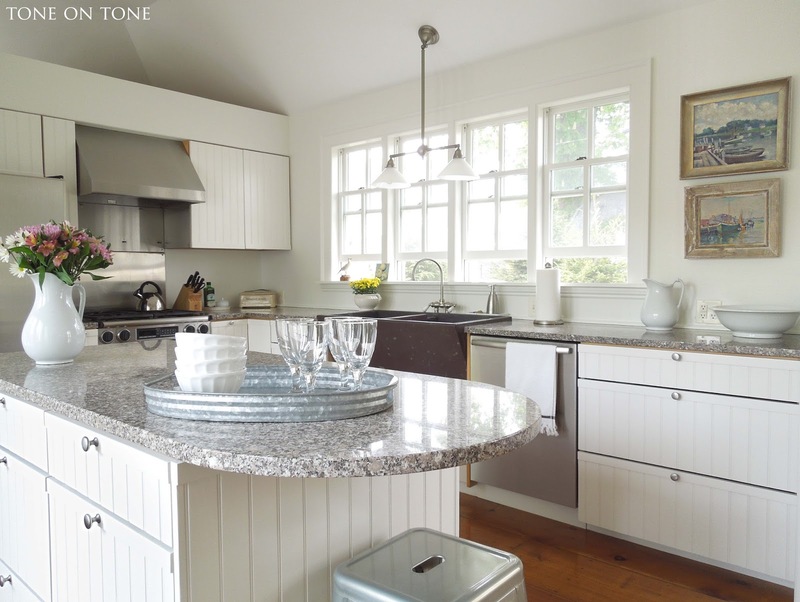 I learned that the granite for the countertops was quarried locally on Deer Isle - an island about an hour from Castine. Also, the soapstone double sink was found at an architectural salvage warehouse. 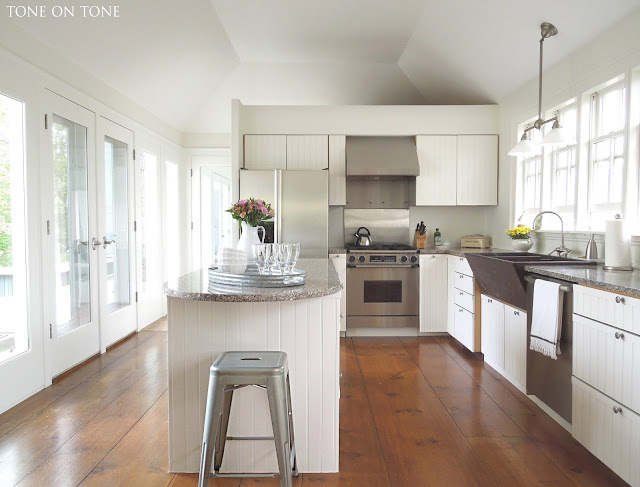 Notice the extra wide pine floorboards - after a lot of Murphy's Oil Soap, they look pretty good. 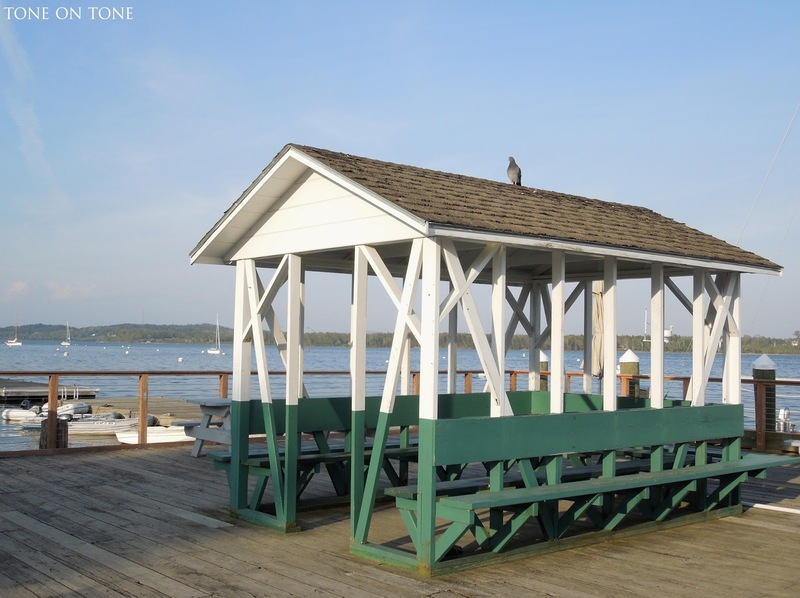 We wanted to refinish them but didn't have the budget. 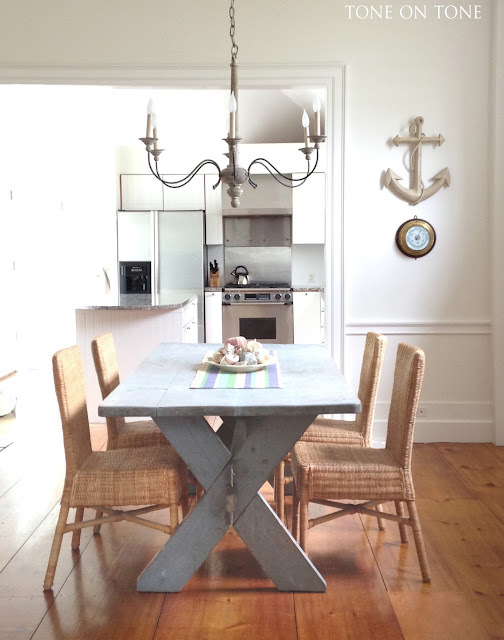 From our breakfast room looking into the kitchen. There is a massive brick fireplace, originally used for cooking, to the left of the eating area. 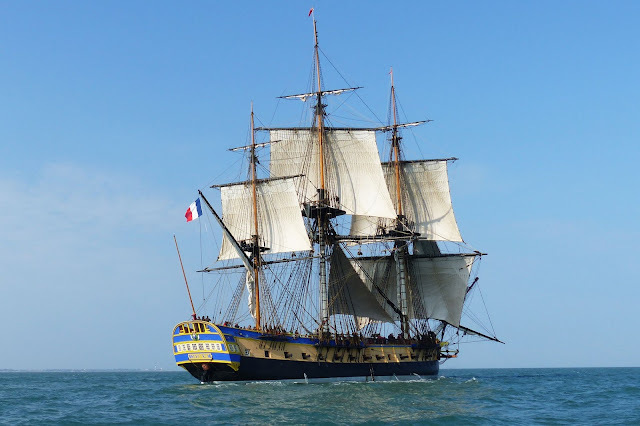 In the 1780s, a majestic frigate (sailing warship) brought the Marquis de Lafayette from France to the aid of General George Washington in the American Revolutionary War. 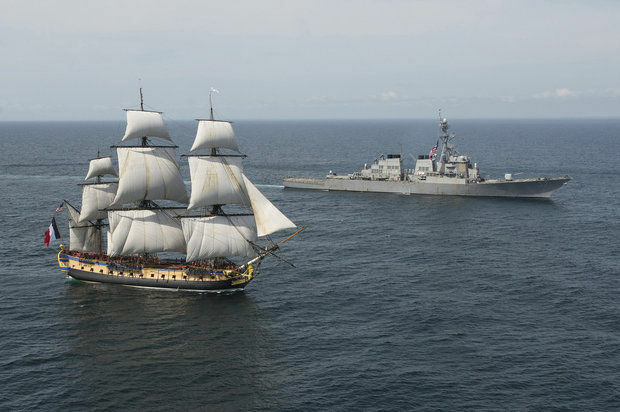 That ship, the Hermione, was part of the naval blockade that prevented British General Charles Cornwallis from escaping Yorktown, which eventually led to the British surrender. 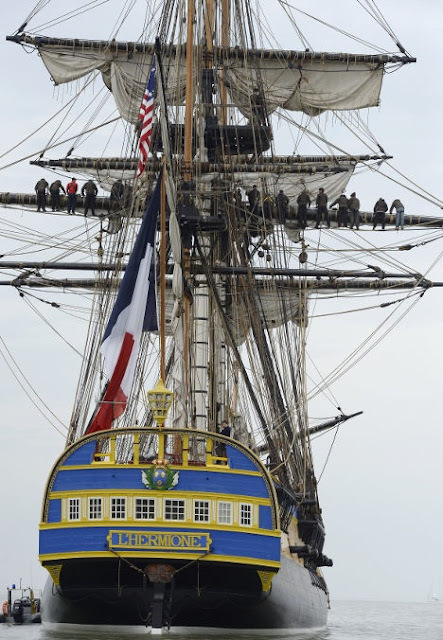 From July 14 - 16, a replica of Lafayette's 145' long Hermione will visit Castine as part of its transatlantic voyage from Rochefort, France, where the 18th century Hermione was built. 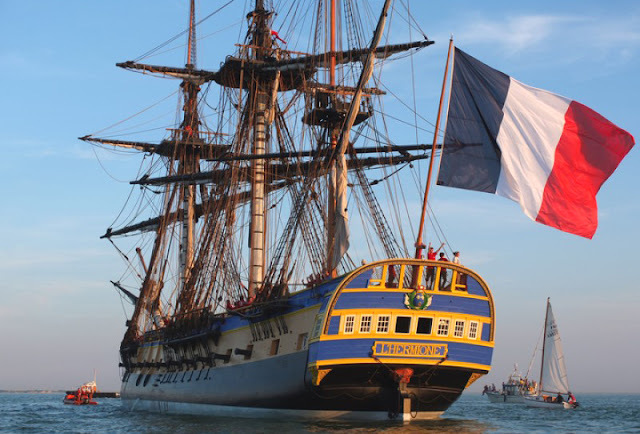 This symbolic visit on Bastille Day is especially meaningful as the original Hermione had visited Castine in 1780 on a reconnaissance mission. 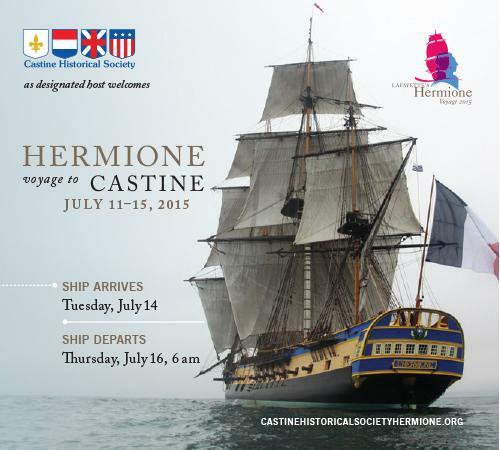 The Castine Historical Society, as designated host, is honored to welcome the Hermione to Castine. For more information, please visit here. Credits and links for the following photos, as available, are provided under each image. 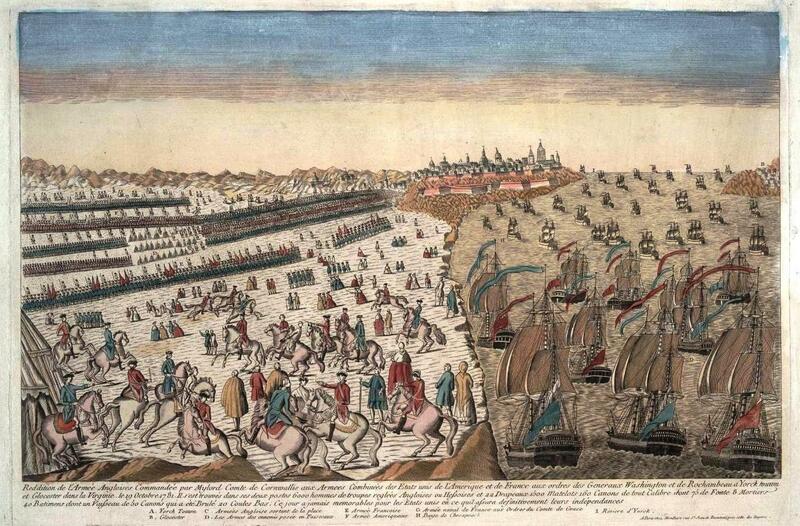 Siege of Yorktown with the French squadron at sea - via Wikipedia here. Photo via The Opinion here. September 2014 - Accompanied by a flotilla, Hermione departing Rochefort for sea trials. Credit unknown. 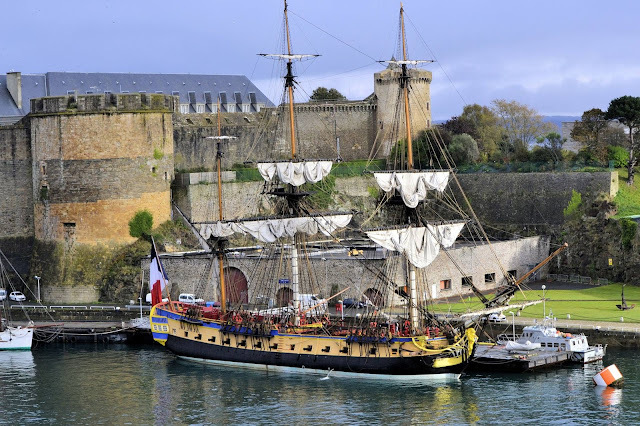 October 2014 - Hermione moored in the Penfeld River at the Chateau de Brest. Credit unknown. 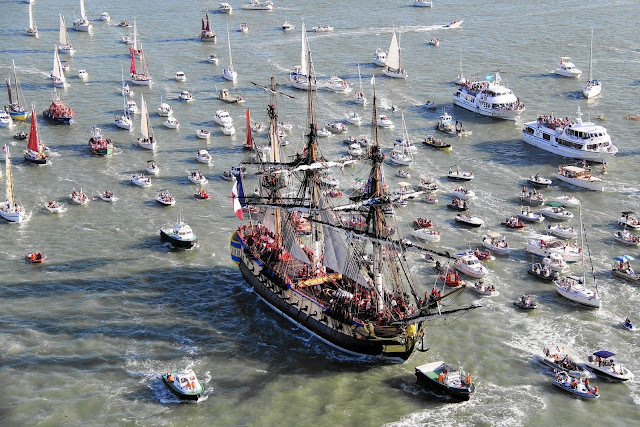 You won't want to miss this highly anticipated historical event. 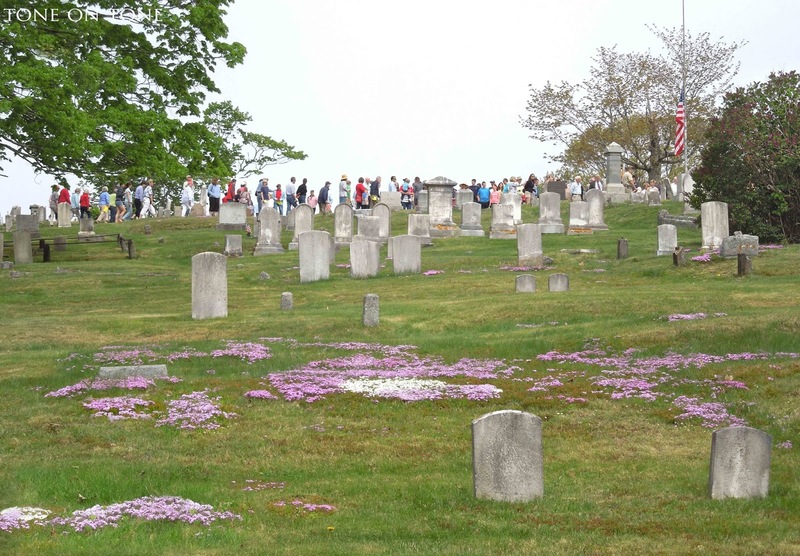 Hope to see you in Castine! PS - For updates, please remember to visit the websites of the CHC and the Hermione.